Ideal all round shoe for any level of player – the G 500 utilises the low profile technology combined with light but durable upper design. Upper Construction • G-LITE lightweight PU vamp provides comfortable water resistant performance. • Split upper design with breathable mesh panels for improved ventilation and flexibility in the midfoot. 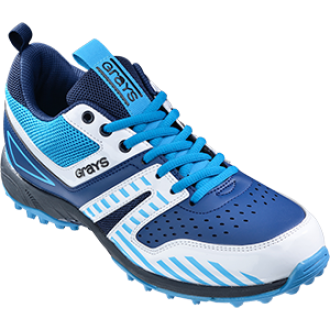 • GTUFF plus- Reinforced rubber compound attached to the forefoot providing increased durability and protection. Internal • Removable Sockliner – pre moulded to the shape of the foot using high-grade memory EVA. • EVA Tongue construction provides superior comfort and ergonomic design ensures the perfect fit. Outsole • Multi directional, multi angled thermo rubber outsole stud formation designed to give maximum forward and sideways traction on synthetic pitches • Dual Density LP Midsole – Low profile EVA consists of 2 densities to reduce the effects of over pronation and improve natural movement of the foot. • Torsion Stability – Micro light Carbon E.P.S technical stabilization unit integrated into the EVA midsole to maintain torsional stability of the shoe.Dual Density LP Midsole – Low profile EVA consists of 2 densities to reduce the effects of over pronation and improve natural movement of the foot. • Torsion Stability – Micro light Carbon E.P.S technical stabilization unit integrated into the EVA midsole to maintain torsional stability of the shoe.